← Sportsthoughts (121) – Today was a good day! Last concert of the year, back to the Roundhouse, where I’ve had some great moments in recent times, notably Prince and 3rd Eye Girl. 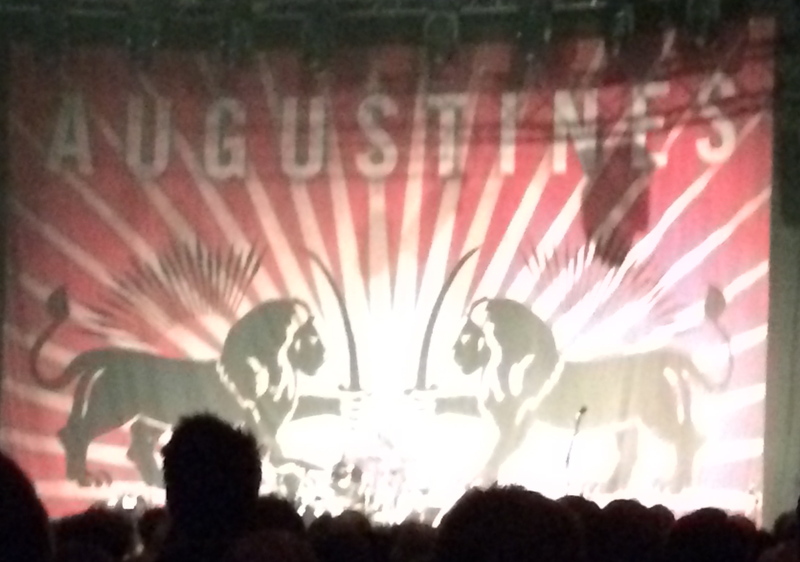 This time it was the mighty Augustines, one of the most energetic rock’n’roll bands on the planet. I’d caught them, fairly briefly, at Latitude, in the summer, part of a brilliant sequence on the Sunday afternoon: Parquet Courts, Fat White Family, Augustines and The War On Drugs. And, of course, there was that cameo at the Berwick Street festival in Soho in April, which I blogged about.Tonight we got the full works and it was amazing! Augustines, led by Billy McCarthy on vocals and guitar, with Eric Sanderson on bass, keyboards and sometimes guitar and Rob Allen on drums, are one of those bands that give you absolutely everything. Their love of the music, their delight at playing to ever-bigger crowds, their passion, honesty, is overwhelming. There are some parallels with early Bruce Springsteen: some of the phraseology, the difficult childhood an inspiration for some of the songs, the redemption in music. The escape, the means of expression, the release of emotion – and the celebration. But it’s simpler, more uptempo, a basic rock’n’roll trio, leavened by the manic trumpet of John Panos on this tour. I’ve seen the band four times now, and this was the best. The intensity remained, the interaction with the crowd, but there was a new confidence. McCarthy knew if he turned the mic to the crowd, they would sing the words, knew they could take risks with some of their best known songs. “Philadelphia (City Of Brotherly Love)”, their most dynamic rocker, was stripped down and slowed down to a heartfelt solo triumph for McCarthy, with added crowd singalong. One of the highlights. Where it turned from a really good concert to a great one was in the drawn out encore, which was almost as long as the main set! But only part of it was on the main stage. First, they appeared, with acoustic guitars, on the balcony and played a couple of songs: “The Avenue”, “Now You Are Free”. The first a lovely ballad, the second one of their anthemic chants. 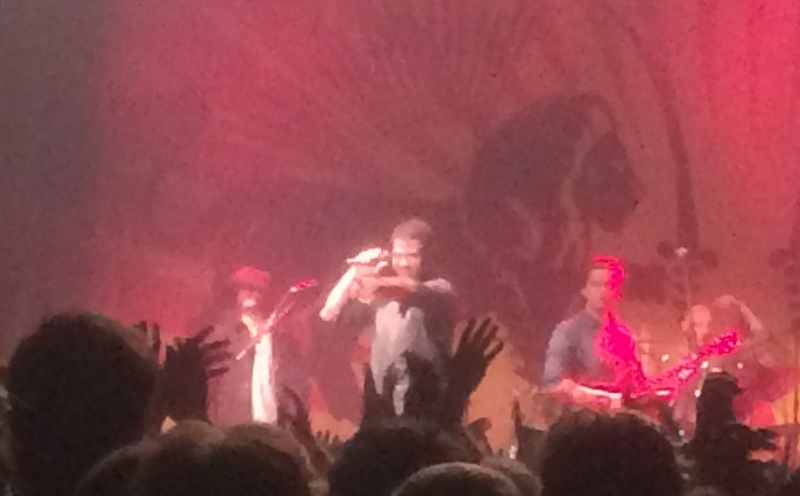 Then they returned to the stage and belted out the awesome “Book Of James”, a song I remember from the first time I saw the band, in front of a few hundred fans in the i-Arena at Latitude in 2012, when I was amazed at the following they already had, and the sheer energy of the performance. The future of rock’n’roll, I said, thinking a little of the hype around Bruce in 1975, when he played Hammersmith Odeon. 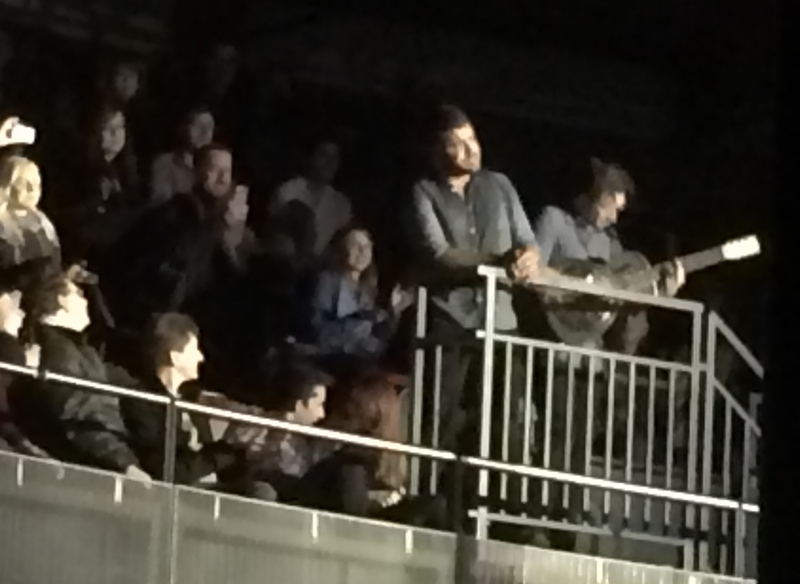 And then, and then, they appeared in the middle of the crowd on the floor of the Roundhouse, again with their acoustics – and communed. There was a raw version of “Weary Eyes” – with audience participation of course – a swaying “East Los Angeles” and then a joyful rendition of Toots and the Maytals “Pressure Drop”. Which was also covered by The Clash – I think there was a connection there. Billy McCarthy shares that rock’n’roll spirit with the great man himself, Joe Strummer. 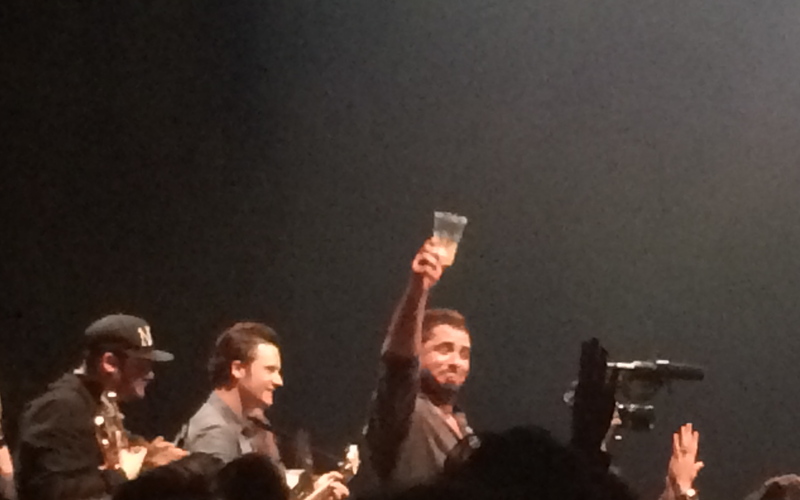 They finished with “New Drink For The Old Drunk” back on stage – I think! Memory was getting blurred by now! He choked as he said it. It seemed incongruous at a moment of triumph. But real. Raw emotion and maybe the reason why Augustines play every concert like it is going to be their last. See them if you can. 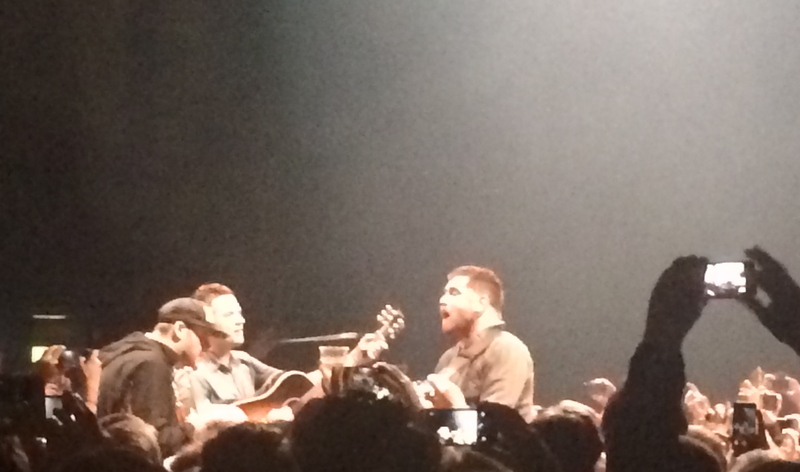 This entry was posted in Music - concerts, lists, reflections and tagged Augustines, Billy McCarthy, London Roundhouse, music. Bookmark the permalink. Oh! I love this. Seems to be a great live band. Could one ask for more? Thanks. Five times this year is impressive! There seems to be a way more open love to music in the UK than in NA. I’ve just started watching a music show from the UK that is very impressive, as so many musicians are featured. I’ll get the name next time I find the show and try to send it next music comment. It might be what my good friend Dood suggests below, but then again it might not! As for Pressure Drop, have you heard the soundtrack album to the film “The Harder They Come”? One of the great reggae albums. Yes, I’ve heard it! Reggae at its roots. I’ve also seen the movie several times. No doubt it is one of the greats! Hi Resa – just wondered if you’re watching Jools Holland? He’s been going for many years now, but the show works because (a) he moves with the times, even if not all of us do, (b) the acts are always so diverse, as you say, and (c) the format has always worked well – speedily rotating through the songs, and you can hop from a megastar to a newcomer, and from folk to dubstep, in five seconds. Much of the stuff I’ve grown to love has first been seen on this show. 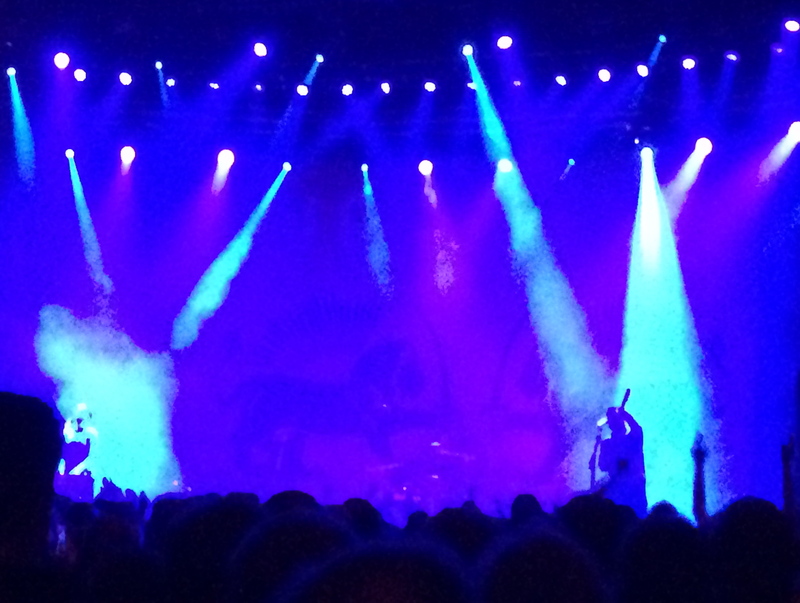 John – great post, and yea verily, a cracking night indeed. As I said at the time, I’ve seldom seen a band playing with such joy and verve and sheer pleasure. Yorxman’s gig at Manchester Cathedral must have been awesome……. The second album will be high in my 2014 top ten – coming soon! Sorry, me again, but I couldn’t resist a tip, One of the all-time Jools Holland classics is Mary J. Blige singing NO MORE DRAMA. I should just be able to drop the link in, but I’m not quite sure how – but if you hit “Mary J Blige No More Drama Jools”, that will take you there. Watch the brief intro by the British DJ Trevor Nelson too – he talks with real warmth about Mary J and the song. And as for the performance, it’s bonkers and it’s brilliant. Hope you enjoy it! reminded me a bit of Kings of Leon at times, lots of slow builds culminating in rousing singalong choruses. Hadn’t heard any of the songs before the gig but found the music very accessible and uplifting. Easy to see why they’ve built a strong UK following as a great live band. You mean you didn’t do your homework?! I don’t really get Kings of Leon – Augustines are far more dynamic, apart from K of L’s first album, “Youth and Young Manhood”, which is a rock’n’roll classic and quite different from the follow ups which made their name. I do get a bit of Foo Fighters, The Hold Steady and Bruce, when he rocked on an album like “The River”. 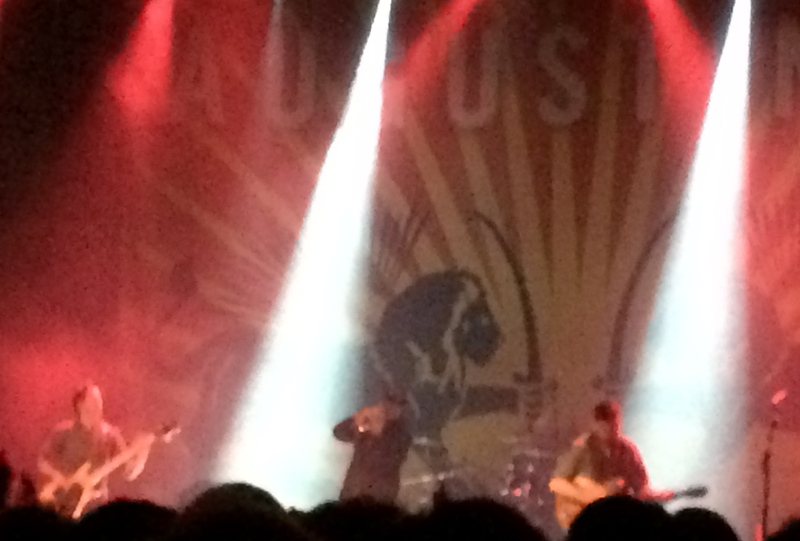 “Fans” and “Use Somebody” remind me of the Augustines style. Dynamic yet restrained; just like you on a big night out. Me again – Jools Holland’s agent? Talking of the Foo Fighters, check out ALL MY LIFE on Jools in 2002. One of the great four-minute rock gigs, with staggeringly riveting riffage. That band doth mightily rock.